"REMEMBER THERE ARE HIDDEN FLAMES IN SURGICAL PRACTICE"
Review Article RETROPERITONEAL SARCOMA Majeed H Alwan MBChB, FRCSEd, FRACS, FACS, Gastrointestinal and General Surgeon, Tauranga Hospital, Tauranga, New Zealand. E-mail: majeedalwan@xtra.co.nz Abstract Retroperitoneal sarcoma (RPS) is a rare tumour. Its management is challenging because of often late presentation when the tumour attain a significant size, and its close relationship to several vital organs and structures in the retroperitoneum. Although surgery remains the main hope in controlling the disease, the use of neoadjuvant or adjuvant radiotherapy and/or chemotherapy remains controversial. Local recurrence is high and there are reports of successful second and third resections after recurrence. In this report the author reports two cases recently he had managed and presents the unique CT scan findings of the first case. This is followed by a brief review of the important matters related to this tumour. Original Articles Rafan Oday Fahad*, Saad Abdulbaqi# & Hassan J Hasony@ *MBChB, MSc Microbiology. #MBChB, CABP, Department of Pathology. @ MPhil, PhD, Department of Microbiology, College of Medicine, University of Basrah, Basrah, Iraq. Abstract Cervical cytobrush and Pap smears were collected from 103 women attending the outpatient department at Basrah Maternity and children hospital during the period from October 2009 till the end of January 2010. DNA was successfully extracted from 91 cytobrush samples, amplified for the detection of human papilloma viruses (HPVs) using GP5+/GP6+ primers, in addition to typing using type-specific primers for HPV-16 and HPV-18 genotypes. The overall HPV prevalence was 20.8% with the dominance of genotype 16 (36.6%) over the genotype 18 (10.5%) and the presence of non-16, non-18 genotype(s) in 42.1% of all HPV positive cases. Younger women aged 25 years or less were more infected (26.3%) with the dominance of genotype-16 (21.1%) and among women aged 36-45 years, the non-16/non-18 genotype(s) were the more frequently observed (13.3%). Infection rates were more frequent among women married above 30 years (33.3%) and those with more than one lifetime husband (28.6%). Women's husband with polygamy practice significantly covariate with HPV infections (P< 0.05). Significant association (P<0.001) was obvious between infection with any HPV and abnormal cytology. The non-16/non-18 genotype(s) were more involved (28%) whereas genotype-16 was detected more frequent (20%) than genotype-18 (4%). In addition mixed infection of both high risk types (16 and 18) was limited only to women with abnormal Pap smears. In archival blocks, the presence of HPV- DNA was constant in pre-invasive sequamous cervical lesions as all blocks revealed a positive HPV-16 either alone or in combination with genotype- 18. PATTERN OF INTESTINAL OBSTRUCTION IN BASRAH; A PROSPECTIVE STUDY Adel Salih Mushari@ & Zaki Al-Faddagh# @MB,ChB, FICMS, AlQurna Hospital. # MB,ChB, CABS, Professor, Department of Surgery, Basrah College of Medicine, Basrah University. Abstract Intestinal obstruction remains one of the commonest surgical emergencies, with hernias being electively repaired; adhesive obstruction has emerged as the leading cause of intestinal obstruction in the west, while the obstructed hernia remaining the main cause in developing countries. 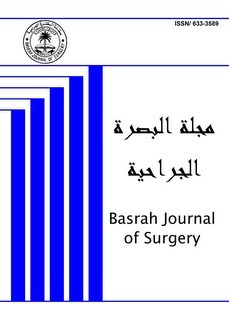 This is a prospective study involving 464 patients admitted with intestinal obstruction to the surgical unit in AL-Mawane general hospital, Al-Sadir teaching hospital, Al-Basrah maternity and child hospital and Al-Basrah general hospital during the period between (January 2004- December 2007). All patients were admitted and thorough careful history, particularly history of previous surgery and examination were done involved the hernial orifice. Type of treatment, time surgical intervention, operative finding and period of hospital stay were noted. Most of our patients were attended for postoperative followed up for complications and recording the mortality in the hospital. The study included 464 patients, their age ranged from 2 days to 75 years. (Mean 33.8years), and they are more frequent in female 258 patients (55.7%) than male206 patients (44.3%). Acute onset of presentation was found in 296 patients (63.7%). Constipation in 419 patients (90%) and abdominal pain in 380 patients (82%) were the main presenting symptoms. Previous admissions for same complain were reported by 64 patients (13.7%). History of previous surgery were reported by 71 patients (15.4%), and time interval from previous surgery, varies from one month to (5) years. Simple obstruction was the most common form of intestinal obstruction (67.7%). Of all patients included in the study, 288 patients (62%) present with small bowel obstruction and 176 patients (38%) with large bowel obstruction. The commonest cause of intestinal obstruction was strangulated external hernia in 99 patients (21.3%), intestinal adhesions in 73 patients (15.7%). The hernia (29.2%) together with adhesions from previous surgery (25.4%) constitute the bulk of causes of small bowel obstruction , while volvulus of sigmoid colon (23.6%)and tumours (22.7%) form the main cause of large bowel obstruction. Intussusception was the most prevalent variety of intestinal obstruction in child age group (27.2%), followed by hirschsprungs disease (22.2%). Of strangulated hernia, inguinal hernia was the most frequent type of hernia seen (71.7%). Surgical intervention was necessary in 409 patients (88.2 %).The period of conservative treatment ranges from 3-14 days, with average (6.3) days. Post operative complication occurred in 167 patients (40.8%). The mortality was 6.8 % and it was related to extreme of life, delay in presentation and mismanagements. The study concluded that simple intestinal obstruction is the commonest type of obstruction, higher rate of strangulated hernia than the rate of obstruction due to adhesions, which is opposite to a typical pattern of developed countries. Intussusception is the most frequents cause of intestinal obstruction in children, early presentation and diagnosis is the key to reducing morbidity and mortality. kassim Trayem Hayef* & Adnan Yassin Abdul-Wahab@ *MBChB, Al-Sader Teaching Hospital, Basrah. @MBChB, FRCS, Assist. Professor, Department of Surgery, College of Medicine, University of Basrah, Basrah, Iraq. Abstract Duodenal ulcer is a particular type of peptic ulcer disease that afflicts the lining of the duodenum. The indications for surgery in duodenal ulcers are; bleeding, perforation, obstruction and intractability or non-healing. Today, most patients undergoing operation for duodenal ulcer disease have simple over-sewing of bleeding ulcer or simple patch of perforated ulcer. Simultaneous performance of vagotomy either truncal or highly selective is increasingly uncommon because of reliance on postoperative proton-pump inhibitor to decrease acid secretion and eradication therapy for helicobacter pylori infection. Despite of the widespread use of gastric anti-secretary agents and eradication therapy, the incidence of perforated duodenal ulcer has changed little. This study aimed to assess the factors that lead to increase the rate of morbidity and mortality in patients with perforated duodenal ulcer in different age groups and to know the effect of time lapsed between onset of symptoms and surgery. This is a prospective study that included 100 patients who underwent emergency laparotomy for perforated duodenal ulcer during a period from May 2008 to January 2011. The operations were done in Al-Sader Teaching Hospital and Al-Basrah General Hospital. The clinical finding, general risk factors, co-morbid medical diseases, operative finding and post–operative complications were all taken in consideration. Follow-up period ranged from 2 weeks to 18 months. Of the hundred cases who included in this study, 96% were males and 4% were females with mean age of 43.13 years (range from 10 to more than 70 years). The disease was more common in rural areas (58%) than in urban areas (42%). Fifty five percent of patients gave previous history of duodenal ulcer and 45% had no previous history of duodenal ulcer. The most common risk factors are smoking (32%) and NSIADs (25%). In this study most of elderly patients presented with medical diseases such as hypertension, diabetes mellitus, ischemic heart disease and chronic obstructive pulmonary disease. Most patients admitted to hospital between 19–24 hours (21%), (8%) admitted during 6 hours and (2%) admitted after 120 hours. Regarding the complications occurs in this study, wound infections, chest infections and paralytic ileus were the most common complications. Mortality rate was 2%. In conclusion, the most common factor that leading to development of postoperative complications is delayed in hospital admission, so to improve the results of treatment of perforated duodenal ulcer, the diagnosis and treatment should not be delayed and the associated medical illness should be treated. Saad S Hammadi*, Salman K Ajlan@, Asal B. Shindi# & Abdul-Sattar J Yousof% *MB,ChB, FICMS, Professor, Department of Medicine. @MB,ChB, MSc, Assist Professor, Department of Biochemistry. #MB,ChB, MSc, Assist Professor, Department of Surgery College of Medicine, University of Basrah, Basrah, IRAQ. %FICMS, Department of Medicine, Al-Faiha General Hospital, Basrah, IRAQ. Address of Correspondence: Dr Saad S. Hammadi. Department of Medicine, College of Medicine, University of Basrah, Basrah, IRAQ. Abstract This study aimed to evaluate the degree of oxidative stress associated with magnetic resonance imaging (MRI) examination. Serum malondialdehyde (MDA) levels were estimated in 70 patients, 44 males and 26 females, 16-70 years of age underwent MRI examination for various reasons. There was an overall increase in serum MDA level following MRI examination with overall mean difference between pre- and post- MRI examination MDA level of 0.066 ±0.110 Mmole /l (P<0.00l). Variables causes significant elevation of serum MDA level included, age older than 25 years (P-values for 25-44 years, 45-64 years and >=65 were <0.001, < 0.05 and 0.001 respectively), MRI examination of durations shorter than 20 minutes (P<0.05) and MRI examinations of the brain (P<0.01) and the abdomen (P<0.05). On the other hand, parameters of no significant effect on MDA levels included younger ages, MRI examinations of durations longer than 20 minutes, systemic diseases and MRI examination of the spine (P>0.05). It is concluded that MRI examination is associated with significant free radical activity reflected by marked elevation of serum MDA levels. This implies that MRI examination may impose an oxidative assault which in turn, may be of clinical significance in elderly patients in particular. 8- LAPAROSCOPIC CHOLECYSTECTOMY IN SICKLE CELL DISEASE: IS IT A SAFE PROCEDURE? Salim M Albassam*, Mohammad M Mohammad@, Jassim H Salim@& Hashim S Alkhayat@ *Department of surgery, Basrah Medical College, Iraq. @Department of surgery, Basrah General Hospital, Iraq. Correspondence to: Dr. Salim M Albassam, e-mail: albassamsalim@yahoo.ca Abbreviation: Hb= Hemoglobin. ACS = Acute Chest Syndrome. ASA = American Society of Anesthesiologists Abstract The aim of this trial is to determine the safety of laparoscopic cholecystectomy for treatment of gall bladder stones in patients with sickle cell anemia (a controversial issue). Sixty patients from both sexes, between 19-35 years old with sickle cell anemia, all of them having gall bladder stones were included in this study in Endosurgery Center in Basrah General Hospital. The patients were divided into three groups, group one (19 patients) were selected for laparoscopic cholecystectomy on random preoperative background, the same thing was applied in group two (21 patients) whose patients were subjected to open cholecystectomy while patients in group three (20 patients) were selected for laparoscopic cholecystectomy on conditioned selection. Three mortalities and two serious morbidities were encountered in the group one and one mild morbidity seen in group two and no mortalities or morbidities in group three. Laparoscopic cholecystectomy in sickle cell patients is a debatable issue, an increasing controversy about serious perioperative and postoperative morbidity were mentioned. The procedure itself was accused and an entirely opposed results were emerged from different studies all are debatable. In this study we noticed the big influence of the risk factors, preparation of patients for surgery and the adherence to the principle anesthetic rules on the outcome after laparoscopic cholecystectomy in patients with sickle cell disease. This influence was limited in open procedure. The controversy in the different trials lies on wither the problem is confined to the disease itself or to the surgical method used for cholecystectomy or both. According to the results obtained from our study we believe that both the severity of the disease and the surgical procedure affecting the results, application of intra and post operative protocol (blood transfusion if Hb less than 9gm/dI, rehydration, oxygenation and respecting general anesthesia rules are mandatory for the safety of the patients. Ali A Al-Iedan MBChB, CABS, Lecturer in Orthopaedics, Department of Surgery, College of Medicine, University of Basrah, Basrah – Iraq. Abstract The treatment of developmental dislocation of the hip (DDH) in older children is a challenge because they have high displacement of the hip, contracted soft tissues, insufficiency of the acetabulum and increased anteversion of the femoral head. In such patients it is difficult to reduce the femoral head into the acetabulum, maintain the concentric reduction and obtain a satisfactory functional hip joint. The aim of this study is to assess the advantage and disadvantage of one stage combined surgery with femoral shortening in treatment of DDH in children above 2 years old. This is a prospective study done in Al-Basrah General Hospital between (June 2008-June 2010), thirty patients were treated (35 hips), 28 females and 2 males. Five hips were right hip dislocation, 20 hips were left and 5 patients were bilateral. Femoral shortening done for all the hips and, in 28 hips pelvic osteotomy were performed at the time of open reduction. At the most recent follow-up (4 months-2 years) According to the radiographic criteria of Severin, 5 hips were excellent, 15 hips good and 10 hips have fair results, 5 end up hips had poor outcome. Avascular necrosis developed in 5 of the 35 hips. All patients were followed with respect to range of motion and recovery from limb-length discrepancy. Different complications were recorded per or postoperatively. Some complications like pelvic fracture (1 hip), subluxation and instability (3 hips), dislocation (2 hips) and stiffness (7 hips). According to the rating system of Mckay's clinical criteria, there were 7 hips excellent, 11 hips good, 12 hips fair results and 5 hips had a poor result. It is concluded that children who are two years or older and have DDH, can safely be treated with an extensive one-stage operation consisting of open reduction combined with femoral shortening and pelvic osteotomy, without increasing the risk of avascular necrosis. The limb length discrepancy that is produced by the shortening does not appear to cause a clinical problem. Jasim D Saud#, Mazin A Abdulla@ & Mushtaq Ch. Abu-Alhail* *#MBChB, CABS, Specialist Surgeon, Basrah General Hospital, Basrah, Iraq. @MBChB, CABS, Consultant Surgeon, Department of Surgery, College of Medicine, University of Basrah, Basrah, Iraq. ABSTRACT This study assesses the impact of spilled gall stones during laparoscopic cholecystectomy (LC) and it's clinically significant complications resulting from stones left in the peritoneum. This is a prospective analysis of laparoscopic cholecystectomies performed at The Surgical Unit in Basrah General Hospital from 1st January 2006 to 31st December 2010. There were 678 patients in the study who underwent LC. The inclusion criteria for LC were: patients of all ages and both genders, symptomatic gallstone disease, recurrent attack while waiting for interval LC, normal values of blood complete picture & liver function tests and ultrasound examination of abdomen demonstrating gallstone disease. There were 73 cases of gallbladder perforation, i.e. a frequency of 10.7%. In 34 of these patients gallstones spillage also occurred in a frequency of 5%. An effort was made in each case to remove the spilled stones laparoscopically but in 25 patients unretrieved stones were left (frequency of 3.6%). Eight patients (1.17%) developed complications, one patient developed ileus which was thought to be the result of irritation from a gallstone that had been shown on US examination. The free fluid in the Douglas pouch resolved with medical management. Two patients developed sub-hepatic abscess, presenting with right hypochondrial & shoulder tip pain and fever post operatively; which confirmed by abdominal sonograph, one patient responded well to medical treatment while the other one required ultrasound guided drainage and broadspectrum antibiotics. Three patients developed epigastric port site infection; two were treated successfully by daily wound care and appropriate antibiotics after culture and sensitivity. One developed persistent epigastric sinus, and a gallstone was retrieved on exploration. Two patients developed sub-hepatic and right sub-phrenic abscess respectively in the seventh post operative day and required open drainage. There was no mortality and long-term morbidity. In conclusion, complications arising from spillage of gall stones during laparoscopic cholecystectomy are rare. They can present months after the cholecystectomy with septic complications. The patients should be informed preoperatively that spillage of bile and gallstones are possible. The surgeon should take utmost care to prevent spillage of stones and attempt to remove all visible stones at the time of surgery. If spillage occurred it should be recorded clearly in the operative notes and such patients should be kept under close follow up to aid in the early diagnosis of later complications. There is no indication for routine conversion to open surgery. Ali F Al-Assadi FICOG, CABOG. Assist. Prof., Dept. of obstetrics & gynecology, Basrah Medical College. Abstract This study aimed to compare the efficacy of two methods (extra-amniotic saline instillation and extra-amniotic misoprostol) for ripening the unfavorable cervix. The study was set at the labour room in Basrah Maternity (teaching) hospital with 300 bed capacity. It is a prospective comparative study conducted to compare extra-amniotic saline instillation and extra-amniotic Misoprostol for ripening the unfavorable cervix. Group I (Extra-amniotic saline instillation): Foley’s catheter with extra-amniotic normal saline instillation at a rate of 1ml/min. Group II (extra-amniotic Misoprostol): The cervix was ripped with 25mcg. Misoprostol injected extra-amniotically using a Foley’s catheter. The clinical trial involved a total (121) pregnant women, in group I (57) and in group II (64). The success rates in achieving cervical ripening were 100% for both groups. The mean post ripening Bishop’s score in group II (primigravidae (7.5 ± 1.5), multigravidae (7.86 ± 1.39)) were significantly higher than those in group I (primigravidae (6.01±0.4), multigravidae (6.07± 0.47)). The mean ripening time (hrs) in group II (primigravidae (6.15± 2.1), multigravidae (4.03± 1.3)) were significantly shorter than those in group I (primigravidae (7.71± 1.02), multigravidae (6.4± 1.02)). The mean induction-delivery time (hrs) in group II (primigravidae (5.3± 2), multigravidae (3.8± 1.4)) were significantly shorter than those in group I (primigravidae (7,7± 2.03), multigravidae (5.92± 1.9)). The vast majority of women under study had vaginal delivery (80.7% in group I and 96.8% in group II). In conclusion, EAM was quick and effective method for ripening the cervix, it requires little training for application so that it is a suitable method for patients who require rapid induction of labour. Haifa Al-Shaheen CABOG, Consultant Obstetrician & Gynecologist, Basrah Maternity & Childhood Hospital E-mail: hayfa_alshaheen@yahoo.com Abstract This prospected follow–up study was carried out over 12 months period (from 1st September 2008 till 30th August 2009) in infertility clinic in Basrah maternity and child hospital to evaluate whether certain criteria assessed during initial screening (number of follicles and ovarian volume) could predict the response to ovulation induction with clomiphene citrate (CC) medication. Clinical, ultrasonographic and endocrine data were collected and analyzed on 58 women with oligomenorrhoea or secondary amenorrhoea with PCOS and infertility before initiation of CC medication. The ovarian morphology were determined by transvaginal U/S which showed all women had altered ovarian morphology ( both ovaries had >10 multiple small cyst of 2-9 mm, mean total follicular number (11.0±2.5) and enlarged ovaries, mean ovarian volume (13.2±4.01). Thirty eight patients (65%) ovulate, the remaining 20 (35%) did not. Age, body mass index (BMI), ovarian volume, number of small follicles, serum LH, testosterone and LH/FSH ratio in CC non responders were all significantly higher than in CC responders (P< 0.05). Data suggest that patients whose ovarian are less likely to respond to stimulation by CC treatment, can be predicted on the basis of initial screening characteristics, such as: BMI, history (oligomenorrhoea, or secondary amenorrhoea) and number of follicles and mean ovarian volume. These ultrasonographic features & laboratory assays could be clinically useful for distinguishing better the CC no responders from responders. These observations may add to ongoing discussion regarding etiological factors involved in ovarian dysfunction in these patients and classification of anovulatory infertile women. Hassanain H Khudier* & Daria Ismail Ameen@ *MB,ChB, FIBMS Path., Department of Pathology, College of Medicine, University of Sulaimania. @MB,ChB, Pathology lab., gynecological and obstetric Sulaimania Teaching Hospital. Correspondence to: Dr. Hassanain H. Khudair, Sulaimania teaching hospital, E-mail: hhk1970@gmail.com Abstract Colorectal cancer regarded as one of the most widespread malignant tumor in the world. It is considered the second leading death factor among people in some developed countries. Colorectal cancer comprises several distinct histological types including adenocarcinoma which forms 85%-95% of all colorectal cancer cases. Pathogenesis of colorectal cancer is a multistep process characterized by involvement of many genetic alterations, including p53. The aim of this study is to detect the expression of p53 protein in colorectal carcinoma and to show its relationship with some clinicopathological features including age, gender, histological types, histological grades and staging. Forty paraffin-embedded tissue blocks of colectomy specimens were used in this retrospective study. They were collected from the Department of Pathology in Sulaimania Teaching Hospital, Shorsh Hospital and Shehid Saifeddin Private Clinic from January 2007 to July 2008. Two sections of 4 micrometer thickness were taken from each paraffin embedded tissue block. First section was taken for hematoxylin and eosin stain and the other one for immunohistochemistry [anti-p53 monoclonal antibody] by using DakoCytomation Envision + Dual Link System-HRP (DAB+). The relationship between p53 over expression and the dependent variable (age, gender, histological types, histological grades, and staging) were evaluated statistically using an analysis of variance (ANOVA) with STATA 8 soft ware (College station, Tx). A positive reaction for p53 was scored on a semiquantitative base as score 0 (no staining), score 1+ (weak staining), score 2+ (moderate staining), and score 3+ (strong staining). Staining was negative for p53 (score 0) in 16 cases (40%). Positive cases were scored as (1+) in 4 cases (10.0%); (2+) in 8 cases (20.0%); and (3+), in 12 cases (30.0%). There were no significant relationships between p53 over expression and age (p=0.682), gender (p=0.924), histological types (p=0.30), histological grades (p=0.516), and the stage of the disease (p=0.281). Conclusions: Considering the p53 protein over expression in a relatively high percentage of patients, it seems that p53 mutation may play an important role in the development of colorectal carcinoma. There were no significant relationships between p53 protein expression and some clinicopathologic variables such as age, gender, histological types, histological grades, and the stage of the disease. Rabia A Alkaban* & Methal A AL-Rubaee@ *MB,ChB. @MB,ChB, DGO, CABOG, Department of Obstetric & Gynecology, Medical College, University of Basrah Abstract This is a case-control comparative study carried out over the period (July 2007-July 2008) to identify the frequent type of D.M., analyze demographic features of diabetic cases as well as to identify maternal, fetal & neonatal complications of D.M. during pregnancy. This study included 160 diabetic pregnant women as (cases) compared to 180 nondiabetic pregnant women as (control) who were admitted to three known hospitals with obstetrical & Gynecology department during same period of study. Such controls had approximated age & parity to that of cases. Type 2 DM was the commonest type among cases who tend to be more advanced in their age with higher BMI compared to controls. Three major risk factors that predispose to develop GDM were family history of type 2 or GDM, advanced maternal age & obesity. Diabetic pregnancy was more likely complicated by abortions, hypertensive disorders, polyhydramnious and preterm delivery with high C/S rate as well as P.P.H. & birth tract injury in comparison to controls. Cephalo-pelvic disproportion consequent to macrosomia was main indication for C/S in diabetic cases in whom not only macrosomic newborns were more but also stillbirth rate was higher with lower Apgar score & more admission to NICU. Diabetic newborns were more likely to be affected by RDS, hypoglycemia & congenital malformation. In conclusion, D.M. is a major medical disorder that exhibit burden on health of both mother & fetus with high maternal morbidity, prenatal & neonatal morbidity & mortality. 15- CARCINOMA OF THE URINARY BLADDER: AGE DIFFERENCES. Abdulla Y Altimari MB.ChB, FICMS, Urology specialist, Dept. of Surgery, College of Medicine, University of Basrah, Iraq. Abstracts Bladder carcinoma is one of the most common cancers of the genitourinary tract. It can affect any age and it has been debated whether young patients have a better prognosis than their counter part. One hundred and six patients diagnosed as carcinoma of the bladder within two years period were classified according to age to 3 groups, below 50, 50-65 and above 65 years old. Comparison was made between the 3 groups in terms of the type, size, stage, grade, and the type of treatments used. The average age of the patients was 58 years. Female patients increased with advancing age. 89.5% of the tumors were transitional cell type and there were no differences between the three groups regarding the histopathological type. There was highly significant differences between the 3 groups regarding the stage, the grade and the size of the tumors with low stages and grades and small tumors sizes detected in younger patients. The majority of younger patients treated with transuretheral resections (TUR) plus intravesical therapy, while the majority of the older patients treated with TUR plus radiotherapy. Carcinoma of the bladder is not uncommon in young age group, and a higher percentage of tumors affecting young age patients in comparison with other populations. Tumors affecting younger age patients are of lower stage, grade and tumor size at time of presentation. Ari Raheem Qader*& Suzan Fadil Jabber@ *Assistant Professor, Department of Surgery, College of Medicine, University of Sulaimania. @Diploma in plastic surgery, Department of Surgery, Sulaimania Plastic and Burn surgery Hospital. *Email:drzangana@yahoo.com, Mobile no.-009647701526316 Abstract Tissue expansion represents one of the major advances in surgery and is particularly applicable to burn reconstruction. The technique provides tissue of similar texture and color to the defect to be covered and has the added advantage of minimal donor site morbidity. This study aimed to assess the results & complications in the correction of post burn scalp alopecia using a tissue expansion, prevention of implant extrusion, lower the infection rate in tissue expansion and expander selection. Forty patients with scalp burn alopecia treated with tissue expansion of the scalp, were included in this prospective study in Sulaimania hospital of burn and reconstructive surgery from February 2002 to September 2009 with age groups ranging from (4-30) years with an average of 15.5 years. Twenty three patients were females. The time period between burn injury and reconstruction ranged between (4-25) years, their scalp defects ranging between (5x10cm -13x25cm). We were able to completely reconstruct 77.5% of the total patients with single or multiple sessions of expansions. The remaining 22.5% patients have benefited from reduction in the percentage of alopecia and recreation of anterior hair line to camouflage their defects. Major complications occurred in 6 cases(15%), in which the expansion process interrupted with removal of the expander. In conclusion, It is not always possible to measure the absolute efficacy of a surgical technique or determine a general guideline its indication of the tissue expansion procedure although afflicted with a broad range of possible complications, the tissue expansion procedure remains a valuable and reliable technique for the reconstruction of post burn alopecia of the scalp. Alaa A Dawood# & Ali Hamzaa* #MB,ChB, FICMS, Orthopaedic Surgeon, Lecturer, Dept. Of Surgery, College of Medicine, University of Basrah. *MB,ChB, Orthopaedic Surgeon, Basrah General Hospital, Basrah, IRAQ. Abstract In this prospective study, 147 cases of trauma around elbow were examined and evaluated. All were unilateral. Only 22 were associated with peripheral nerve injuries (14.9%). Males were 19 (86%) and females were 3 (14%). Their ages were between 5 and 54 years (mean 24 years). The radial nerve was found to be most vulnerable to injury (40.9%) followed by ulnar nerve (31.8%) and lastly the median nerve (9.1%). The injurious agents in 2 patients were bullet and missile while in 20 were civilian causes. In thirteen cases (59.1%) there were primary nerve palsy and in 9 (40.9%) there were secondary nerve palsies. The degree of nerve injury in 13 patients were neuropraxia (59.1%) with complete recovery, in 6 were neurotmesis (27.3%) and in 3 were axonotmesis (13.6%). The full recovery of the nerve was in 13 patients (59.1%), 12 of them by spontaneous recovery (54.5%) and one of them by surgical exploration and neurolysis (4.5%).Timing of nerve recovery were variable, range from 1.5 to 8 months. There was no recovery in 9 patients (40.9%). We concluded that when closed fractures are complicated by primary nerve deficits, waiting for spontaneous re-innervation seems reasonable up to eight months and early surgical exploration is better to be avoided, conversely if closed fracture complicated by secondary nerve palsy early exploration of nerve is favored except in Tourniquet palsies. Mahmood H Kubba MB,ChB, Diploma Orthopaedic Surgery, Department of Surgery, Basrah General Hospital, Iraq. Address of Correspondence: Mahmood.Hassan67@yahoo.com Abstract Two cases of large forearm bone gap about 7 and 13 centimeters respectively treated by auto– nonvascularized fibular graft are presented. Both cases showed a good union and regain nearly full function of the forearm at 3, 8 months respectively.